The notebook measures 14 x 1.8 x 21.3 cm and contains 192 ruled pages. 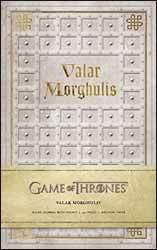 "Valar Morghulis" is the saying of the Faceless Men, a cult of assassins, and translates as "All Men Must Die" and is printed, in gold, on the front cover. The back cover is printed with "Valar Dohaeris", which translates as ‘All Men Must Serve’. The front is embossed in a stone grey effect with recessed gold lettering and pattern, the back of the notebook is the same, but in dark slate grey. The effects and pattern are meant to resemble the doors on the House of Black and White, the imposing entrance to the Faceless Men’s citadel. The edges of both the outer cover and the pages have been rounded off. Inside the front cover there is a double page picture of Braavos showing the colossus which stands at the entrance to the cities port, the picture has been given a sepia tint to create an aged effect. At the back you have another double page picture, this time it depicts Arya Stark in the Faceless Men’s citadel, the right hand side of which also acts as a handy pocket for small notes or other paper objects. The notebook comes with a rubberised band which is used to keep the book shut when not in use and a cloth bookmark. Overall, it’s a nice object for collectors of Game of Thrones memorabilia.